Everest Base Camp, Gokyo Ri, Kala Pathar, Chukhung Ri, Renjo La Pass and Cho La Pass, in this combination of Gokyo Ri and Everest Base Camp Trek, you have all fantastic view points of Everest Region in one tour. 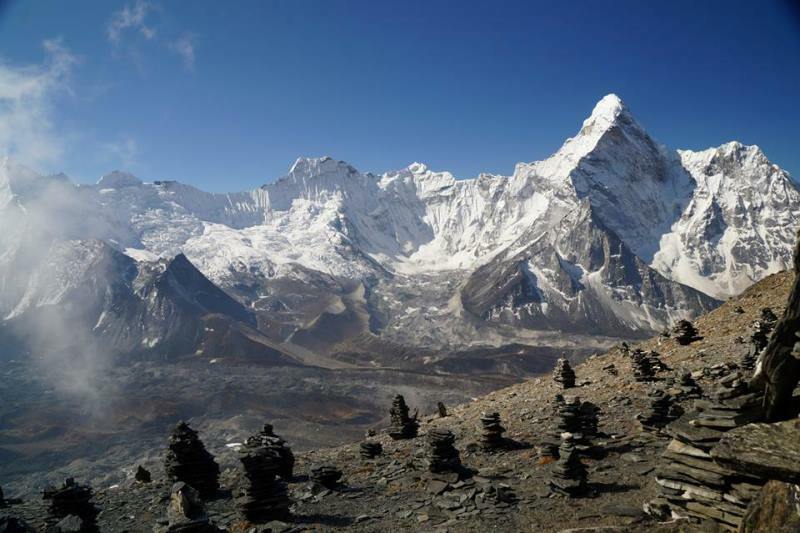 In this circuit trek you will hike 3 mountains, cross 2 passes from where you have stunning views of the mountains and hike one part on the touristic route of Everest Base Camp Trek and the other in the more secluded valley of Gokyo. 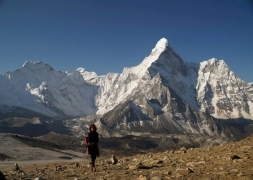 This trek is the most adventurous trek in the Khumbu Region with extraordinary views of Himalayan giants like Mt. Everest (8848m), Lhotse, Makalu, Amadablam, Kanchenjunga, Nuptse, Mt. Pumori and many more, as well as beautiful views of the Gokyo valley with its turquoise blue lakes. You will experience the rich culture of the Sherpa people and see the largest glacier in Nepal's Himalayas, the Ngozumpa Glacier. You will cross the beautiful forest with various flora and fauna and wildlife which belong to Sagarmatha National Park and you will state the change of the landscape by reaching higher elevations. Green forest until the tree line and then scant stone rocky area and glaciers. After sightseeing in Bhaktapur, you will start your trek with a scenic flight from Kathmandu to Lukla, which is a great adventure itself. From Lukla our trek will start, following the Dudh Koshi River, passing through rhododendron and pine forest. Before Namche we will enter the Sagarmatha National Park with its waterfalls, beautiful Sherpa villages and enjoy the first view of Mt. Thamserku (6608m). Sagarmatha National Park is the UNESCO listed heritage site, where you can find various flora and fauna and wild life like snow leopard, red panda, Himalayan thar, etc. Day 04: Trek to Namche Bazar (3450m) - 6 hrs. Upon our arrival at Tribhuvan International Airport (TIA) in Kathmandu, you will be picked up and transfered to the hotel. Today in the evening you will have a welcome dinner and can try authentic Nepali food like Dal Bhaat. Nepali people eat this meal 2 times a day and say winking that it makes them strong (Dal Bhaat Power - 24 hour). You will get to know your guides and they will provide you a detailed briefing on your upcoming trek so that you are well prepared for the trip and any last-minute question will be answered. After breakfast, we will be escorted to Kathmandu domestic airport for an early morning flight to Lukla (2,800m), which is itself a great adventure and takes about 40 minutes. This is one of the most beautiful air routes in the world culminating in a dramatic landing on a hillside surrounded by high mountains peaks. In Lukla we will meet other crew members and after some packing and arrangements, we start our trek through the prosperous village of Lukla until we reach Phakding. Our walking distance is not far today, so if you are interested, you can visit a small monastery near Phakding. Follow the Dudh Koshi River and cross several rope bridges, one of them the famous Hillary Suspension Bridge. The first few hours the way will be easy and you can get the first great views of Mt. Thamserku (6618m) and enter Sagarmatha National Park with its waterfalls, beautiful Sherpa villages and various flora, fauna and wildlife. After crossing Hillary Bridge, the trail starts getting very steep and you have to climb about 1 1/2 hours until you reach Namche Bazar, which is the main trading centre of this region. If you forgot anything you need for the trekking you can be sure that you can buy it here. Today we will make a rest day in Namche Bazar, because we have to become accustomed to the height. Health experts recommend us to stay active and moving during the day. After breakfast we will visit the Tourist Visitor Center near the headquarter of the Sagarmatha National Park where we can observe an assortment of things related to the first Everest ascenders, Sherpa culture and learn about the various plants and animals of the Everest region. You have also great view of the Himalaya from there. 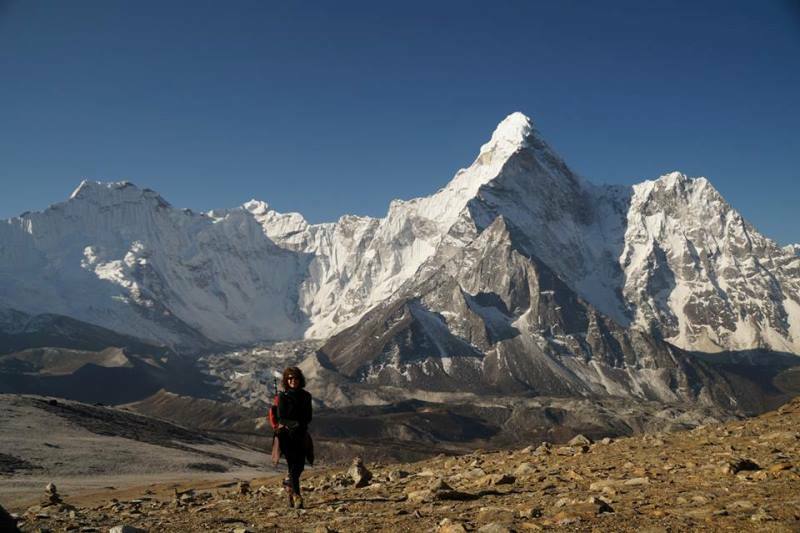 Then we will continue our hike to Khumjung village, with a fantastic view of Ama Dablam (6812m). After that we will come back to Namche and spend the rest of the day there. After breakfast we head west along the valley of the Bhote Koshi called Thame. It is situated at an important junction along the primary trade route to and from Tibet via Nagpala Pass. The distance from Thame to Gokyo is too long for one day, that's why trekkers usually have an intermediate stop at Lungden, which is only a small village with few houses, but a convenient base to climb the Renjo La Pass. The walk is quite easy, but when we reach 4000 meter height, we feel more difficult to breathe. The scenery is quite different from anything we had seen so far. The trail goes above the tree line and the landscape is one of vast expanses of dry barren land with distant white peaks on the horizon, it is almost desert-like. Renjo La is the high pass that connects the Thame and Gokyo valley and it certainly offers some of the best views in the Everest area. You have fantastic views west to the mountains of Rolwaling Himal and the Tibetan border and east to the entire Everest range. Amongst others you will see Mt. Everest (8848m), Mt. Nuptse and Mt. Lhotse from there. Today you will cross the glacier and walk to Dragnak. This will be one of the hard days of our trek. We will start early in the morning with pack lunch and climb steep up to the pass. The view from there is not so good as the view from Renjo La, but you will cross big fields of snow and ice on your way down to Dzonglha. The walk today will be not so hard. You will walk a long time straight without rise. The trail to Gorak Shep goes ahead through the lateral moraine of the Khumbu Glacier. Ahead on the trail we see crest of north ridge of Everest along with Mt. Pumori, Mt. Mahalangur, Mt. Lingtern, Mt. Khumbutse, Mt. Nuptse, etc. A small ascent would take us to Thangma Riju from where we perceive 360 degree vista of snowy mountains. Climbing steeply up to the top through the torrent of Changri Glacier, we catch our first glimpse of Kala Patthar, a grey-green knoll beneath the Mt. Pumori. As we reach Gorak Shep, we will find snow-capped mountains looming all around us including the top of the world - Mt. Everest. After a brief lunch and rest, we continue our way to Everest Base Camp. From the Base Camp we are not able to see Everest but instead we have good views of Nuptse, Khumbuste and Pumori. Today we get up early so that we can enjoy the sunset from the top of Kala Pathar. It takes about 2 hours to reach the top and from there we have a 360 degree view of the mountain peaks. When reaching the top, you will feel joyful as you achieve the moment that you've been dreaming of, since the planning of your journey. You have great views of Khumbu glacier, Mt. Everest, Mt. Lhotse and Mt. Nuptse and enjoy the sun rise behind the peak of Everest. In this moment you know that the effort to reach this top of the world is worth it. We can take as many pictures as we want with our camera but do noy forget to imprint the vista into our mind's eye so that it lasts a lifetime. After breakfast in Gorakshep you will trek down to Dingboche. After breakfast we will start our climb of Chhukung Ri. With packed lunch we will first trek to the village Chhukung and then climb Chhukung Ri. At first it is not so difficult, but the last part goes steep up to the peak. But on the top we will be rewarded with a stunning view of the mountains which we will enjoy during our lunch break. Then we will hike back down to Dingboche. Tengboche is a great place for close up views of Mt Ama Dablam, Mt Nuptse, and Mt Everest, and it is famous for the biggest Buddhist Monastery of the Khumbu region. If it fits we will visit the monastery the same day at around 3 pm to witness the ceremony in the principal and popular monastery of Everest region. Today we will go back to Namche and enjoy the last day, on which we can see a vide variety of hight mountains. The distance is really far today, but because it goes always down and you are well acclimatized it will be not so difficult for you. Back in Lukla you can relax or explore the small village and the numerous small shops. Today is free or last minute shopping for souvenirs or gifts to your family, friends or relatives. Then you will be transferred to the airport and fly home - with a lot of stories to tell! Personal expenses as: laundry, telephone calls, snacks, beverages, etc. Mt. Everest: highest mountain on earth with a height of 8.848m, incalculably and incredible fascinating at the same time, first ascent in 1953 by Tenzing Norgay and Edmund Hillary. All these thoughts come automatically in our minds when we hear this name. And it inspires many of us to experience this mountain in reality, to explore the area, where the big expedition on the peak start and to feel the atmosphere during these huge mountains and large glaciers around us, which let us feel so small compared to this incredible landscape. Climb 3 mountains, cross 2 passes and visit Everest Base Camp - all of the most fascinating and breathtaking view points in one tour!